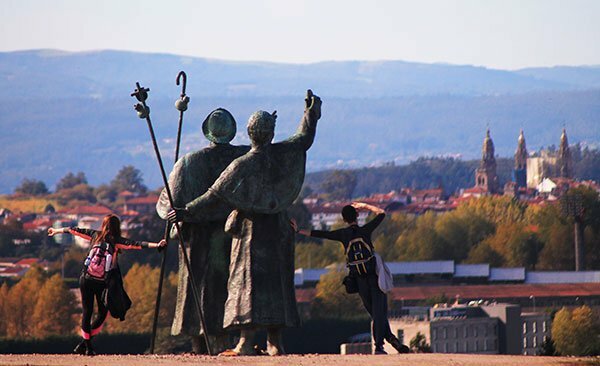 Most people have a clear idea of why they want to walk the Camino de Santiago: for religious reasons, as a personal spiritual journey, for a healthy challenge or just the social aspect. Whatever your motivation for walking the Camino, make sure you get your ‘Pilgrim Passport’ to get it stamped along the way, documenting your progress. 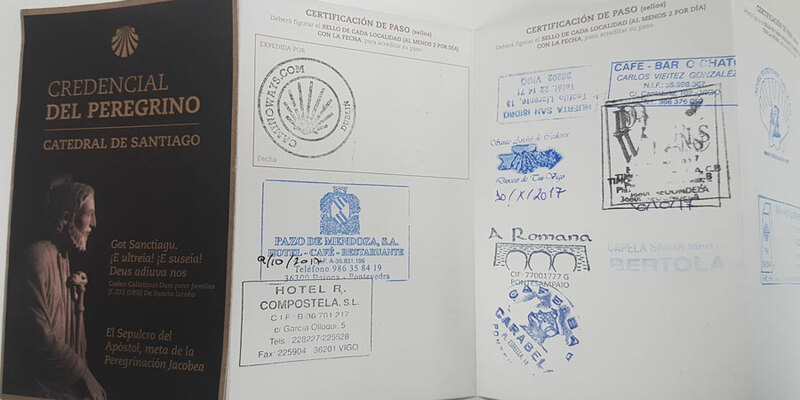 This Camino passport (Credencial del Peregrino) will be proof that you have walked the 100km necessary to obtain your ‘Compostela’ or ‘Certificate’, the official documents testament to your journey. You can get your Pilgrim Passport at the start of your route and you can buy it in many establishments, shops, churches, etc… along the Camino; you can also buy if from your local St James Society. 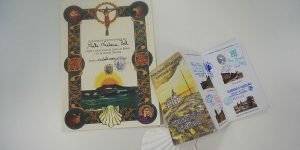 If you are travelling with CaminoWays.com, your holiday pack includes the official credencial issued by Santiago Cathedral. If you start your Camino in Galicia you will need to collect at least two stamps per day from churches, town halls or other official establishments on your way to Santiago (at least for the last 100km). Correos, the Spanish postal service, has special Camino stamps available to pilgrims in many post offices along the Camino de Santiago, including the post office in Rua do Franco, Santiago de Compostela. If you start from outside Galicia you will only need one stamp per day. Once in Santiago de Compostela, you must show your stamped Pilgrim Passport at the Pilgrims Office to apply for your Compostela certificate and any other pilgrim certificate you might want to receive. The ‘Compostela’ is the original religious certificate written in Latin, expended by the Church when pilgrims prove they have either walked 100km or cycled (or travelled on horseback) 200km to Santiago de Compostela. Originally, pilgrims used the scallop shell as proof of their pilgrimage but this quickly became a fraudulent practice with many people buying and selling shells. From the 13thI century, the Church introduced a more rigorous system based on letters, the origin of the ‘Compostela’. The ‘Compostela’ was a valuable document: pilgrims used to travel to Santiago in pilgrimage, in many cases as a penance. By getting a certificate showing they had walked to Santiago they could get back home and show they had paid their penance; repented for their sins. Apparently, a roaring trade of forged ‘Compostelas’ lso boomed in Santiago in the Middle Ages. The way to Santiago seemed to be paved with good intentions! For some, walking to Santiago and getting their ‘Compostela’ meant they had secured their reference letter or VIP ticket to heaven: the ‘Compostela’ was considered an important paper, one to show St Peter at the gates of heaven. In the 16th century, the Catholic Queen and King Fernando and Isabel, created the Foundation of the Royal Hospital and started the construction of a pilgrims Royal Hospital in Santiago, in the building that hosts today the luxurious Hostal dos Reis Católicos Parador hotel. By showing their ‘Compostela’ pilgrims could stay for up to three days. Today, the hotel still provides free meals for three days to 10 pilgrims with their ‘Compostela’. Many things have changed since the Middle Ages. Today, many cycle or walk the Camino for leisure, as a cultural experience and other non-religious reasons but this doesn’t mean you can’t get a certificate as a souvenir of this very special journey. Pilgrims travelling for sport or cultural reasons can obtain a non-religious version of the Compostela, called Certificate of Welcome, also from the Pilgrims Office in Santiago (Rúa Carretas 33). The same rule of 100km for walkers and 200km for cyclists and horse riders apply for this certificate. 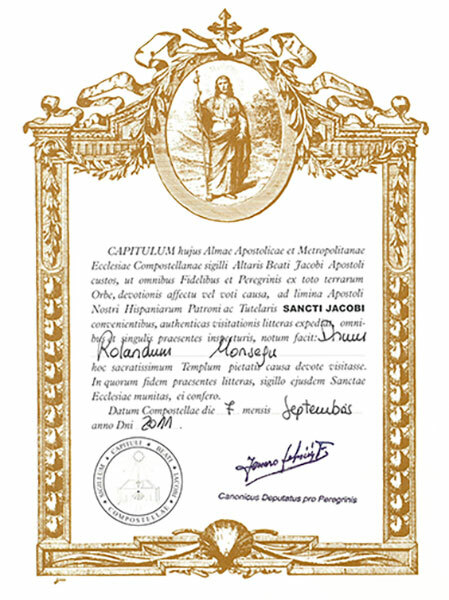 Compostelas and certificates are issued to pilgrims, on a donation basis, by the Pilgrims Office in Santiago. If travelling as part of an organised group, the Pilgrims Office also has a special service, where the names of the group can be submitted by email a few days in advance by the group leader (a special form from the Pilgrims Office must be filled in). Once the group has reached Santiago, the leader can bring the group’s pilgrim passports to the office avoiding queues and receive all the ‘Compostelas’ for the group. Another certificate of distance is also available, stating the starting point and distance walked/cycled of each pilgrim, available in many different languages. This can be obtained in addition to the ‘Compostela’ and it costs €3. If you walked the Camino before that date, you can request this certificate by emailing the Pilgrims Office in Santiago. 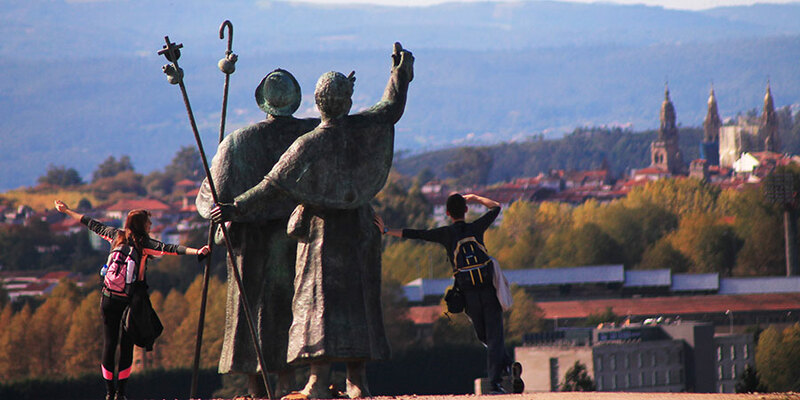 It might not get you a fast track to heaven but it will be a nice memento of your trip to Santiago! If you are visiting Santiago Cathedral (and if you’ve walked all this way you probably are!) you can request a Cathedral Visit Certificate (Certificado de visita a la Catedral), also from the Pilgrims Office (from 9 until 2pm). Ask at the door to direct you to the Archdiocese office. You can request it also on behalf of your group and you will only need the name of the people visiting, and a donation of €3. 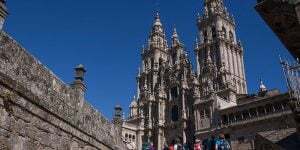 *Please note in order to receive any of the certificates issued by the Pilgrims Office in Santiago your finishing point must be Santiago de Compostela. *Take your pilgrim certificate if you are planning on attending pilgrim mass at the cathedral as some pews are reserved exclusively for pilgrims. Hi Linnea, Thank you for your message. Unfortunately you cannot get credit for starting your Camino in the USA. This may happen in the future. I know from heading out on the trails that any prep walks you do are not wasted and good practice before you walk the Camino de Santiago in Spain. Kindest wishes, Lisa. Hi Dona, you will qualify for the Compostela if you are walking from Vigo to Santiago, just make sure you stamp your passport at least twice per day. Buen Camino! I have walked over 50 k from Porto toEsposende earlier this September. I am now walking from Vigo to Santiago. Will I qualify for a compestela ? Unfortunately not, you would have to walk at least the last 100kms into Santiago. In this case you would need to start in Sarria. I hope this helps. See this blog post: https://caminoways.com/getting-the-compostela-certificate. The same rules apply for the certificate of distance and the Compostela certificate. Kind regards. Does it mean that I can take Certificate of Distance only for the distance from Palas de Rei to Santiago de Compostela which is about 65 km. ? Dear Tanya, unfortunately you can only get the Compostela or Certificate of Distance from the Pilgrims Office if you walk the last 100kms into Santiago (on any of the routes) but they don’t add up different stages. We hope this helps! Let us know if you need anything else. We are walking from Estella to Logroño which is about 45 km and from Palas de Rei to Santiago de Compostela which is about 65 km. A total of about 110 km. Can we get a certificate of distance? Thanks in advance for the answer. Hi Monica, thank you for getting in touch. If you are walking all the way from St Jean, 1 stamp a day should be fine. 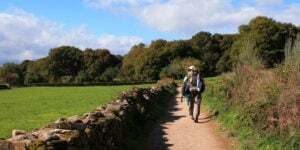 You’d need 2 per day if you were only walking the last 100kms from Sarria. Buen Camino! !